While the boat is unattended, the BILGEWATCH 8 constantly monitors and records the pump activations and ALARM output activations (Counts up to 999 for each Pump, Alarm and Period) for up to 8 bilge pumps. Two outputs are provided to trigger an ALARM and an ALERT, with user set delays for each pump. The maximum recording time for each period is 99 days. There are 4 periods: the current period plus 3 history periods. 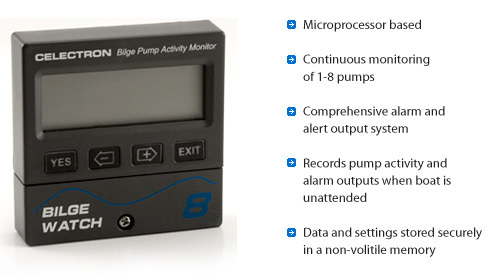 When the boat is attended, the BW-8 continues to monitor the pumps, but if the inhibit option is activated this will disable the ALARM output and the recording function, while maintaining the ALERT output - allowing the user to exclude expected pump activity, such as from washing down bilges or known water ingress when under way (e.g. Leaking shaft stern gland seals etc.). Four keys are used to access all of the functions :- The two arrow keys are used to move between options or to alter settings - The YES key selects an option or accepts a setting - Pressing the EXIT key returns you to the previous menu option, it also switches off the alarm. The BW-8 has a 5 second delay before it records a pump activation, to rule out false activations, such as those caused by the boat rocking due to wave action. When more than one pump is active, the display cycles through all active pumps. If a pump stays active and exceeds its user set alarm delay then the BW-8 triggers the ALARM and ALERT outputs and records the ALARM output activation; the Backlight, ‘AL’ and the BELL symbol flash. The ALARM and ALERT outputs are limited to 10 minutes, but can be stopped at any time by pressing the EXIT key. If a power failure occurs, it is indicated by displaying a BROKEN LIGHTNING FLASH symbol to indicate that the DAYS count may not be accurate. This is recorded with the history period information for future reference. The BW-8 will automatically recover from a power failure. Recorded information can be accessed from the DISPLAY option in the main menu, the display will alternate between pump activations and ALARM output activations and will cycle through the pumps in use automatically (the arrow keys can override the automatic cycle). The pumps history periods can also be accessed from the DISPLAY option. To conserve power, the display backlight (brightness is user selectable) is normally OFF until a key is pressed. The backlight will extinguish 2 minutes after the last key press. Activations and settings are stored securely in non-volatile memory.